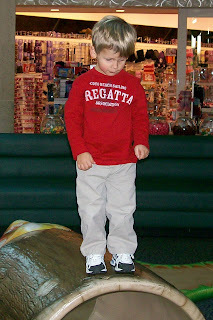 A few pictures from our trip to the mall, where Dawson had lots of fun at the indoor play area. 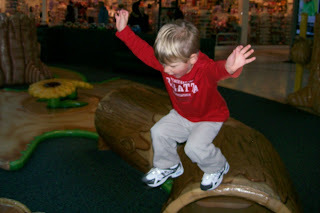 An action shot of him leaping off a tree trunk. 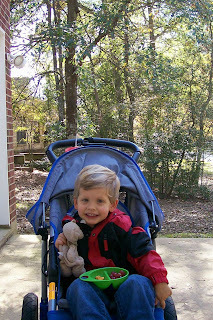 Dawson with a little friend he made while there. Standing tall on another tree trunk. 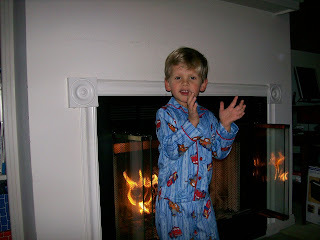 Dawson got these cute Cars pajamas for Christmas. He looks so adorable and so grown-up! This weekend, we took down all of our Christmas decorations. We thought it might be traumatic for Dawson because he loved them so much, but he actually enjoyed helping us put everything away. 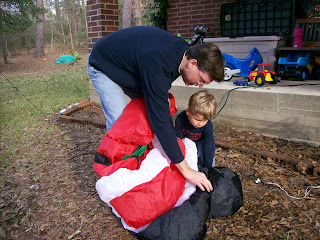 Here are some pictures of him helping Randy deflate our outdoor decorations. 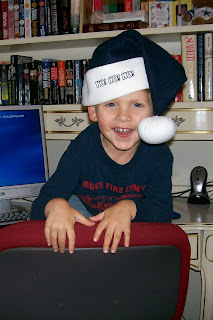 He was a great little helper. 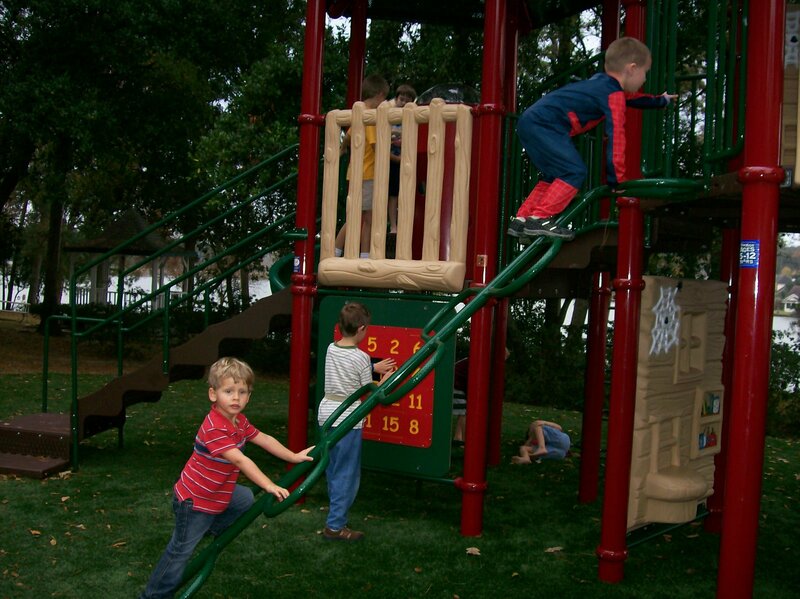 We're so happy that our new park has swings! 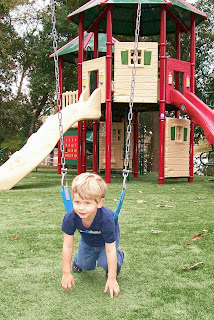 Dawson loves to swing. 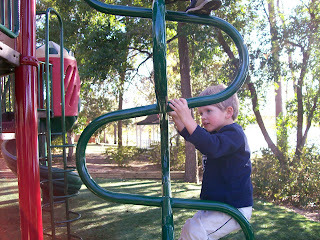 He's trying to navigate a pretty complicated ladder. He actually made it all the way to the top and then just needed me to help him make the big leap to the platform. 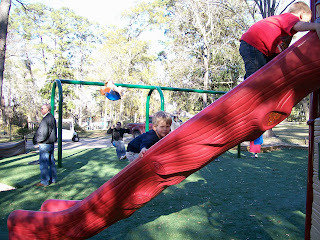 Following a friend up the slide. 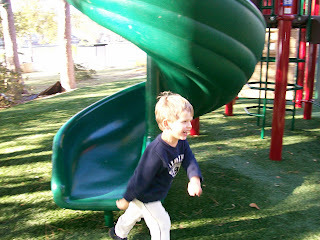 He just came down the slide and immediately takes off. He has so much fun running after the bigger kids. 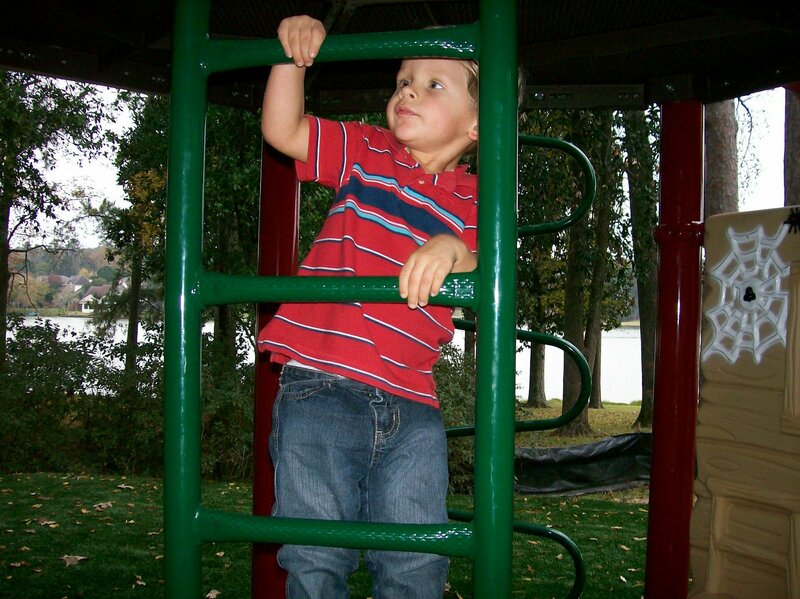 Here he is at the very top of the playground, making noise by hitting the bars with his hands. Dawson loves all the costumes he received for Christmas. Here are some pictures of him in a few of his costumes. Looking very handsome in his knight costume. 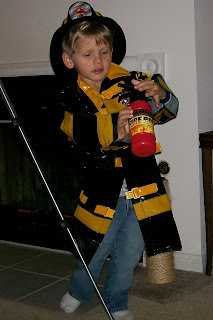 With the fire extinguisher in hand, he immediately went to the fire place because he knows that's where the fire usually is. 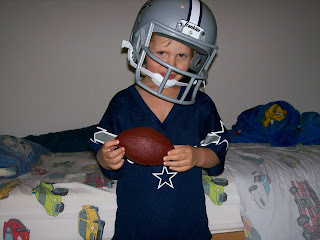 Here he is in his Dallas Cowboy attire. Go Cowboys! 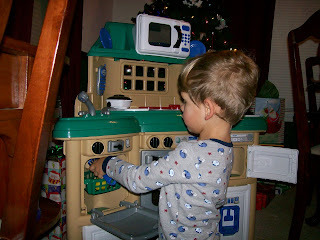 Dawson favorite Christmas gift was his play kitchen. It's small but it serves it's purpose, and it was a bargain at only $38. He's already spent many hours "cooking" and enjoys serving us the food he's made. Putting some food in the oven. This is the dishwasher, and yes, he puts food in the dishwasher. He wants to be sure it's nice and clean. 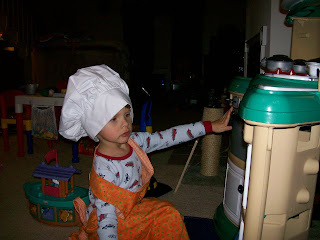 At one point, he told me that he needed his chef hat and apron. He wanted to look the part while he baked his pumpkin pie (that seems to be what he makes most often). 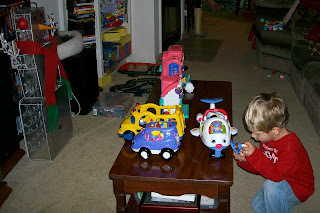 He was very excited about the gifts he received and wanted to open and play with each one after he opened it. 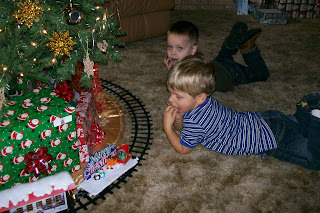 And we did play with each and every thing after he opened it because we wanted him to savor and enjoy his presents and not just be in a frenzy to open everything at once. This really prolonged his Christmas experience. He played with his presents from Santa for about an hour, then we had breakfast, then he opened and played with about half of his gifts from us. 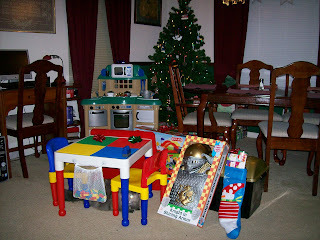 He was so content with all of those fun toys, that we didn't open the second wave of gifts until Christmas evening. It was a wonderful and amazing Christmas. 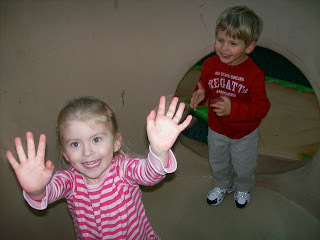 It's so much more enjoyable with Dawson - he makes everything so exciting! Santa was very generous this year. 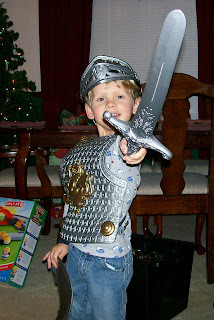 He brought Dawson a play kitchen, Lego table, knight costume, chest of dress-up clothes, Little People airport, and a stocking full of fun things. Dawson was so excited to see all of his new toys when he walked downstairs! 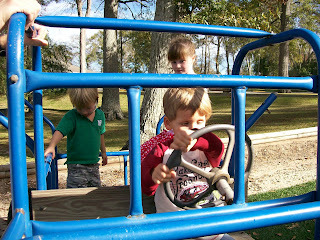 Here are a few pictures of our time at the park the other day. Dawson climbing up the slide. 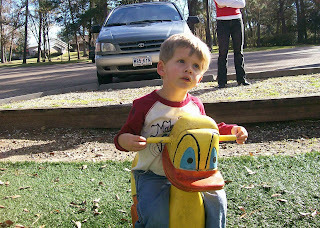 Contemplating something important as he rides the duck. Driving the truck. 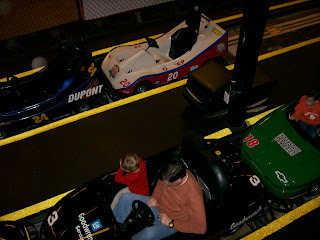 He told us he was driving to Wal-Mart. 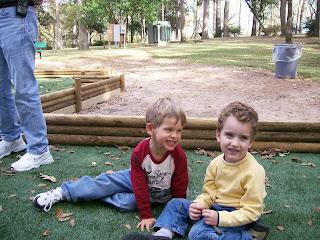 Dawson and his friend, Cameron. Dawson enjoying a snack at the park. 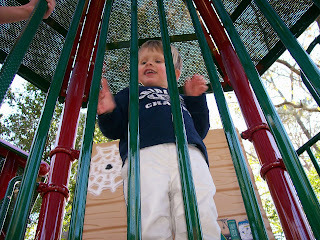 The weather has been very warm the last few days so we've been enjoying lots of park time. 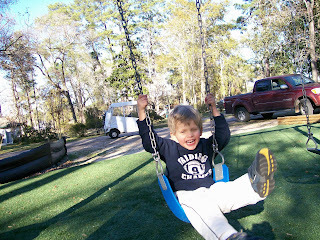 Dawson has discovered the fun of swinging on his stomach. 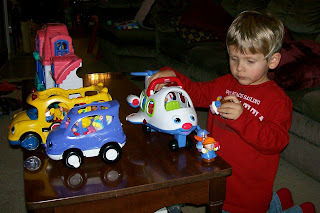 Dawson still enjoys playing with all of his Little People toys. 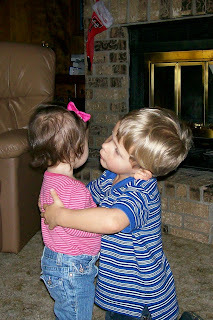 He is so sweet playing with them - they have all kinds of conversations with each other. 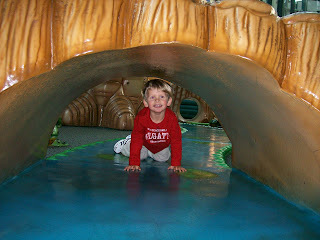 I love watching him using his imagination when he plays and hearing the things he comes up with. 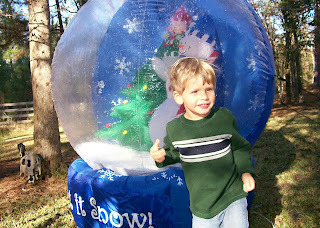 A cute boy and his snow globe. We finally put up a few of our outdoor Christmas decorations. 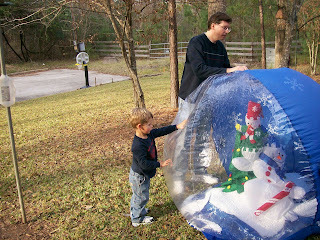 The most exciting additions (from Dawson's perspective) are the giant blow-up Santa and the blow-up snow globe. 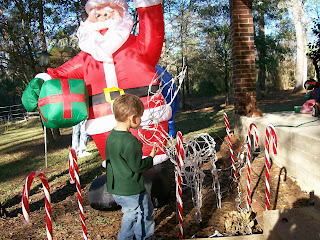 He "helped" Randy put them up, and was so excited to see them "all pumped up" as he says. And once we came inside he made frequent trips to the window to look out at them. On our way to Wal-Mart one day we drove past a dead, stinky skunk. I mentioned to Dawson how stinky the skunk was and he told me he needed to get cleaned off in the bath. We often tell him he needs a bath because he's stinky so he thought a bath would be the solution to the skunk's stinkiness as well. I noticed some dirt on Dawson's pants and when I asked him about it he told me the dump truck dumped it on his pant. Every morning as soon as we come downstairs Dawson insists we turn on all of our Christmas decorations. He knows we have to plug them in to turn them on and will tell us to plug them in. But when it comes time to turn them off he'll say "plug them out." Out is the opposite of in so that must be right. Whenever we're outside on cold days and we see or hear some birds, Dawson will say, "They must be cold. 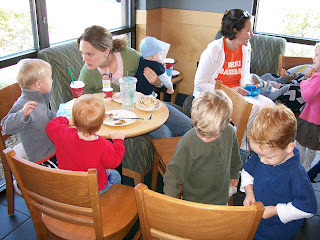 They need to go back to their nests and turn the heater on." 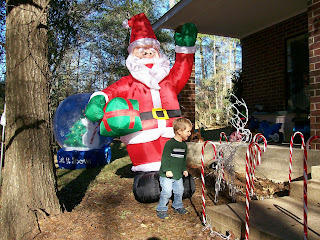 Last year Dawson was a little leery of Santa and didn't want to go anywhere near him. This year, he decided that if we would go with him, he would sit on Santa's lap. Once he was on his lap, he was completely at ease. 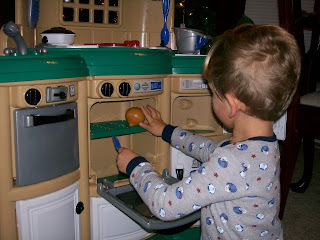 He told him exactly what he wanted for Christmas (a play kitchen and a knight costume). And he smiled so nicely for the picture! Dawson really enjoys Beethoven's music. He first heard it on one of his computer games and showed a particular interest in Beethoven's Fifth Symphony. 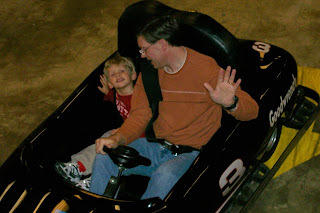 A couple of months ago when we were watching America's Funniest Home Videos, they had a segment on messy kids, which was accompanied by Beethoven's Fifth Symphony. Dawson immediately recognized it and shouted excitedly, "Beethoven" And this past weekend when we were at Target we passed by a music station playing a sample of a Beethoven CD. I didn't really notice it at all, but Dawson did as he told me "that's Beethoven." 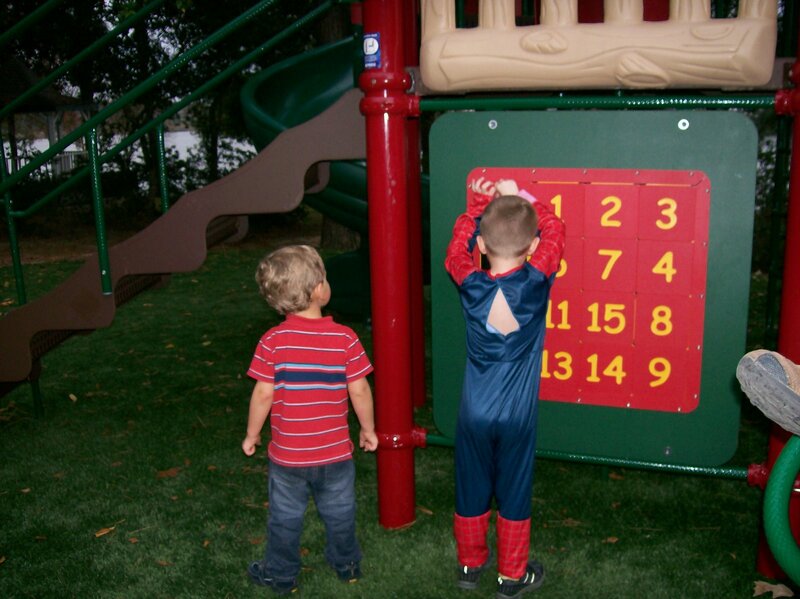 Dawson also does a good job of identifying musical instruments that he hears. We'll be driving in the car with the radio on and he'll say, "that's a trumpet" or "that's a tuba." I'm not musically inclined at all so I have to check with Randy to see if he's correct. 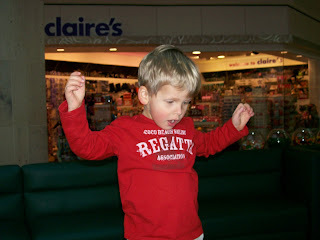 He's not yet 3 and he already knows a lot more about music than I do! 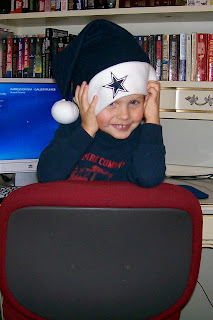 Dawson wearing a Dallas Cowboys Santa hat he discovered at Gramps house. 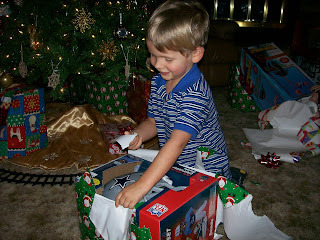 Dawson received a Dallas Cowboys uniform for Christmas. It was a big hit! I hope to have a picture of him wearing the entire uniform soon. A big smile as he sees what's inside. 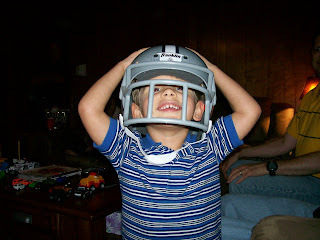 Having a great time wearing his helmet. 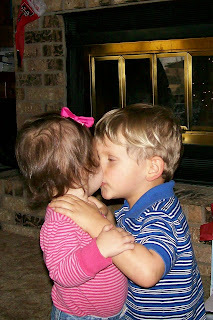 Dawson giving Caselyn hugs and kisses. 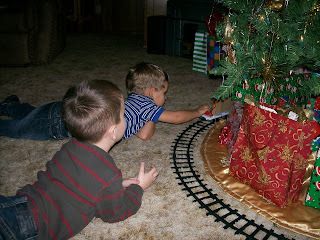 Dawson and Chance were both enthralled with Gramps' Christmas train. 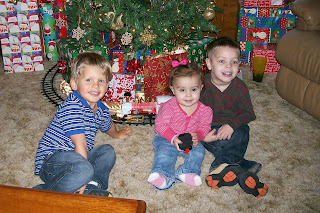 Dawson with his cousins, Chance and Caselyn. Dawson is fascinated with this light-up Christmas golfer. Here, he's getting an up close look at him (or her). Dawson has been accompanying me on my jogs recently. For a while, he had been staying home with Dad while I went jogging because it was too cold outside or because I was running distances that were too long and boring for him. 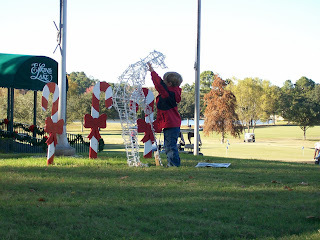 But now I'm only running 3 or 4 miles at a time, we stop at the park to play for a while, and he's thrilled to see all the Christmas decorations in the neighborhood. His enthusiasm and excitement helps me to keep going. He's the greatest running partner! Dawson: I want to build a snowman. Mom: We don't have any snow. Dawson: But I want to build a snowman. Mom: I'm sorry, but there's no snow outside. Dawson: (after a few seconds of thought) Is it snowing now, Mom? Mom: No, it isn't. 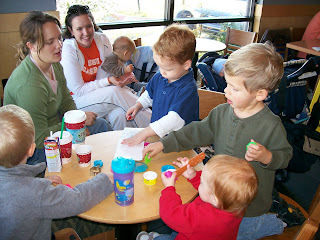 How about if we build a snowman with play-doh? Dawson: (very reluctantly and with a tone of dissapointment) Okay. 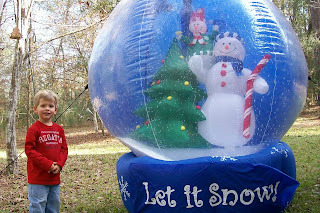 I feel sorry for the poor kid who will likely never see snow fall in Huntsville. I want him to experiece playing in the snow, building snowmen, making snow angels, having snowball fights. I guess we'll have to take him elsewhere for all of those memorable experiences. Dawson is fascinated with the sun and the moon. He realizes that the sun is out during the day and the moon is visible at night. He's also discovered that sometimes you can see the sun during the day. He's very excited on those mornings when he can see both the sun and the moon in the sky. Here are a few comments he has made when referring to the sun and the moon. I can't touch the sun, it's too hot. But the moon is cool. I can touch the moon. Look, Mom, the sun is following us. Hi, sun. Mom, say hi sun. We have to get the moon. We need something . . . . a hot air balloon. We'll go up, up, up to the moon. 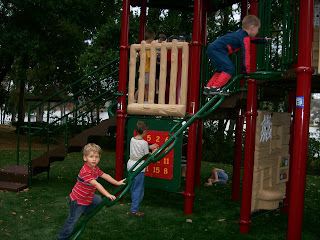 More pictures of Dawson playing at our neighborhood's new park. 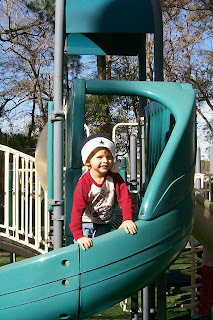 He loves it when there are other kids at the park, and he was very excited to see Spiderman at the park on this particular day. 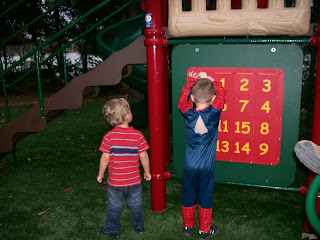 Watching Spiderman slide the numbers around on the puzzle. 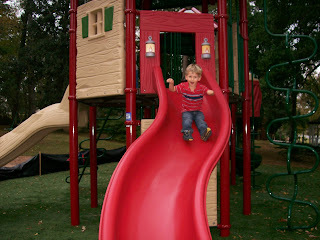 Going down the slide - it's twisty and it's really fast so he loves it.